About a month or two ago Born Pretty Store contacted me and asked if I'd review a few products for them. And my reply? HECK YES!!! I love Born Pretty Store. 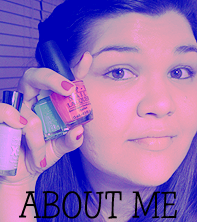 They have affordable, high quality nail art tools, polishes, studs, nail decals... everything! And, yes, even nail stamping plates! 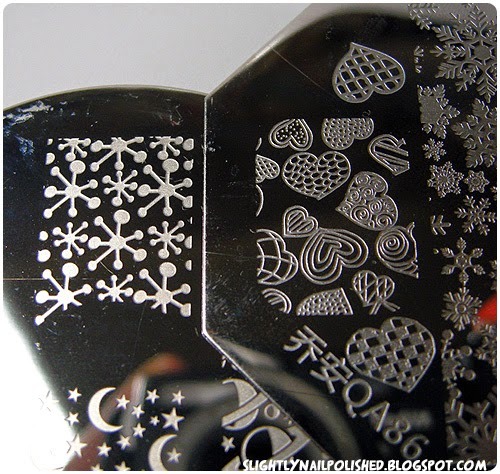 And today, I have a review for nail stamping plate QA86. 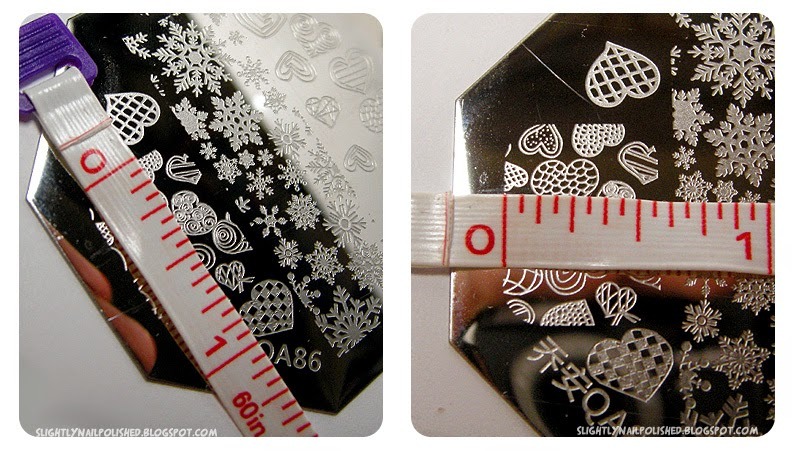 As seen in the image above, the image plate comes with the blue film you have to take off before stamping. It's not paper backed, so be careful of sharp edges, but the plate actually comes with the blue film on the back too. So leave it on for added protection. Oh, and did I mention that the plate contains a bunch of really cute images. 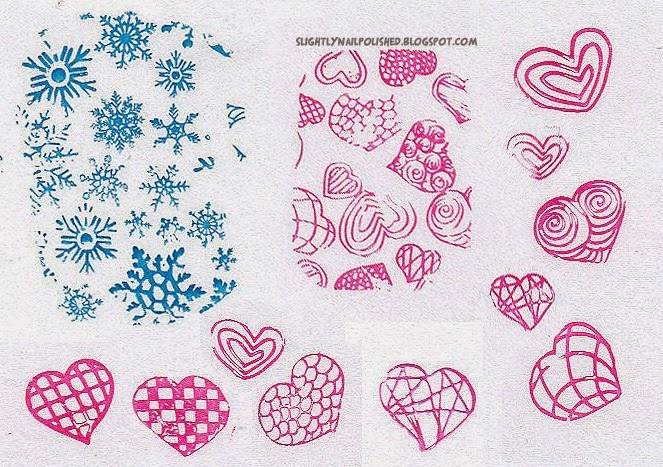 Tons of hearts and snowflakes of different shapes and sizes. What a great assortment! 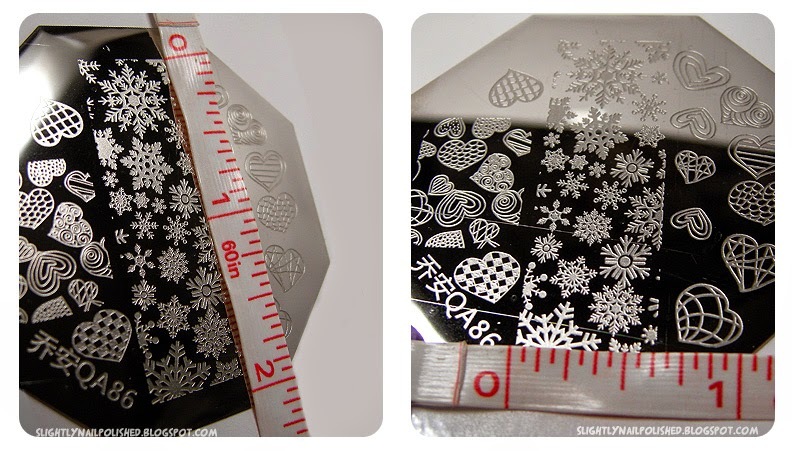 One thing you'll notice right away when looking at this plate is that it has a long rectangular shaped collage of snowflakes running down the center. The image is HUGE! It's about 1 7/8 inches long and 5/8 of an inch wide. What's great about this image is that it offers a great variety of patterns. 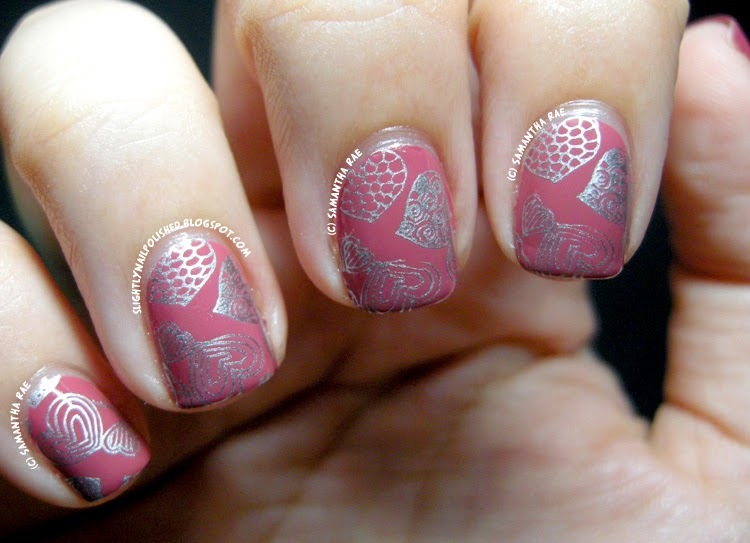 As long as you stamp in a different spot on the image, your nails won't look the same. So no 'cookie cutter' nails here! The other full-nail image on the plate is a collection of hearts. Very cute for any time of the year! The image is pretty big; about 9/16th of an inch wide and 3/4th of an inch long. Now, that may not seem very big... but its actually really big for a full-nail image. To help compare, here is the heart image against a cheeky image (plate CH46 from the Summer 2013 set). Just to give you a little background, Cheeky has the biggest images I have in my collection. And the QA86 image is actually BIGGER than the Cheeky image. I'm sure you're wondering about the image quality, huh? Well let me answer that question too! Not bad, huh? I used my XL squishy stamper, which is notoriously bad at picking up thin lines, and it picked the images up rather nicely! 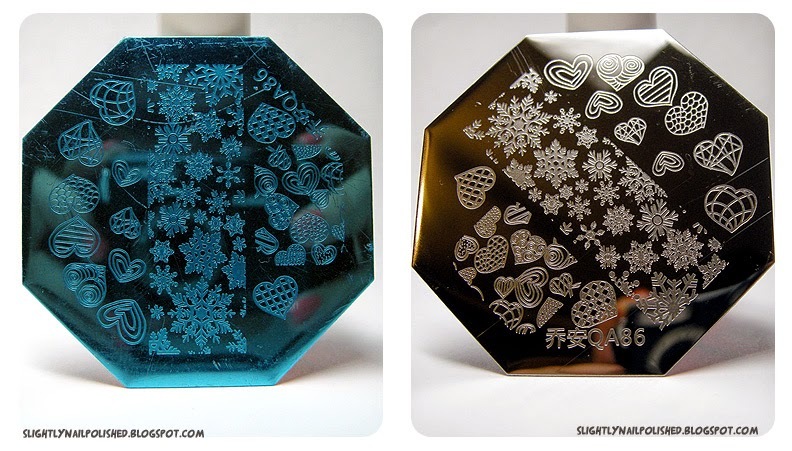 I used my konad stamper with this plate later and it actually picked the images up better, if that's even possible. The images are deeply etched into the plate, giving you full, detailed images. I'm very impressed. A little test of all the images on this plate. Nice! 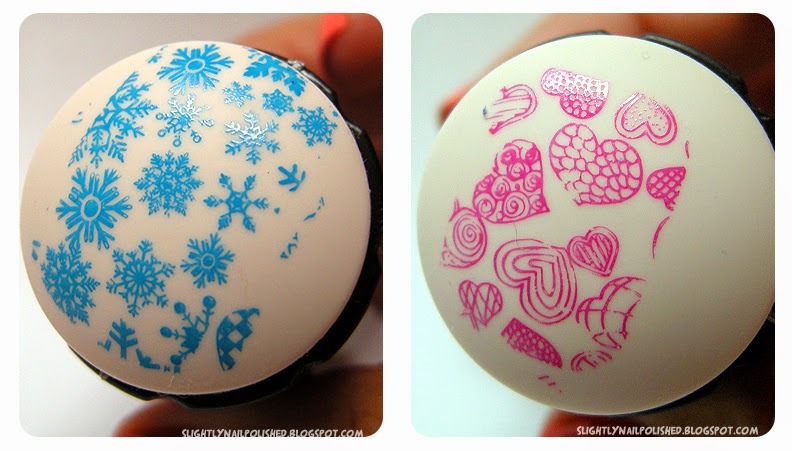 the trick with the single hearts is to move really quick when stamping. Otherwise, you lose some of the detail and thin lines. But if you're quick enough, you can get really solid images. I love the variety this plate gives! At $2.99USD with FREE SHIPPING (which is super fast btw) you really can't get any better. The images are crisp, clear, and you have a huge variety to chose from. I love this plate. Simply said. If you're interested, check the plate out for yourselves HERE. And as if this couldn't get any better, Born Pretty Store gave me a coupon code to share with you all! How nice is that?! To get 10% off your next purchase, just use the code SR10K31. And don't forget to tell them thank you!